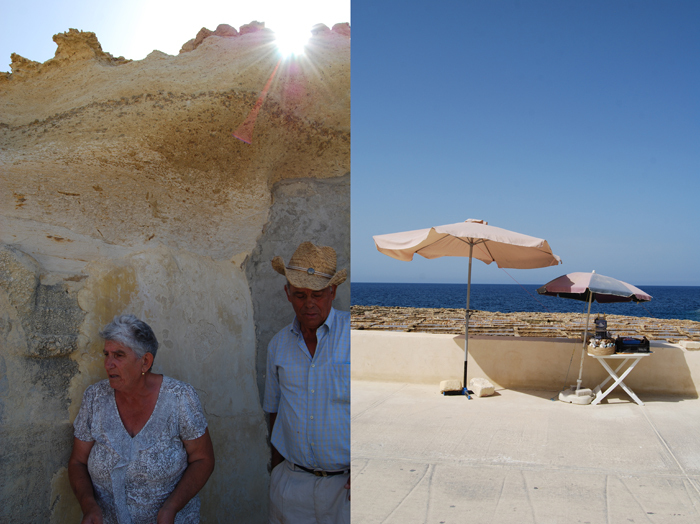 Gozo is one of the most magical places I know, it’s Malta’s silent and peaceful sister island, full of natural beauty. Whenever the ferry reaches Mgarr harbour in the south of the island after a 20 minute crossing of the channel between the two islands, I feel overwhelmed by its serenity and happy to be there again! 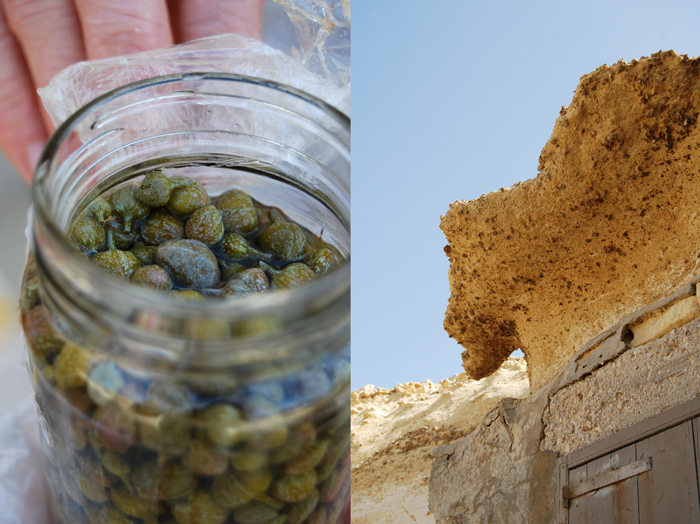 There is so much to write about Gozo, so many places to introduce you to and I will do that in the next few days, but for now I will show you just one of them which is very special to me. 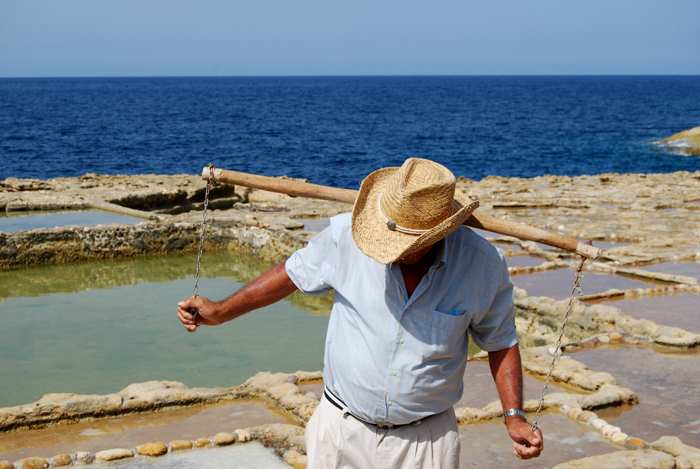 It’s a place that produces a product which I use every day in my cooking, Gozo sea salt. 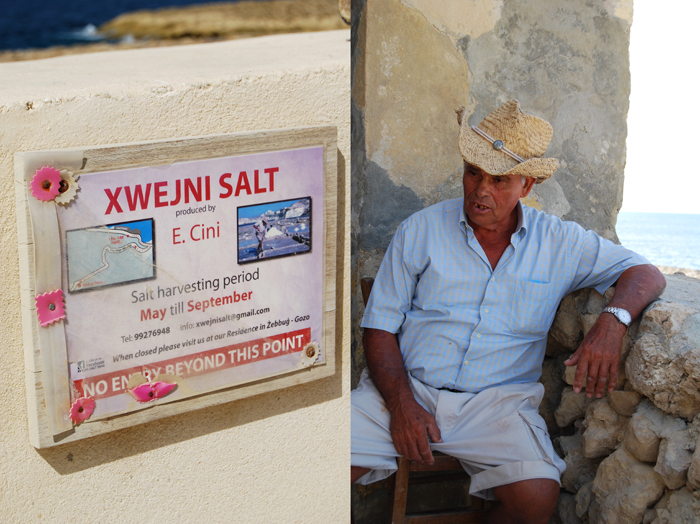 I buy my salt at the Xwejni pans in the north, owned by the Cini family. 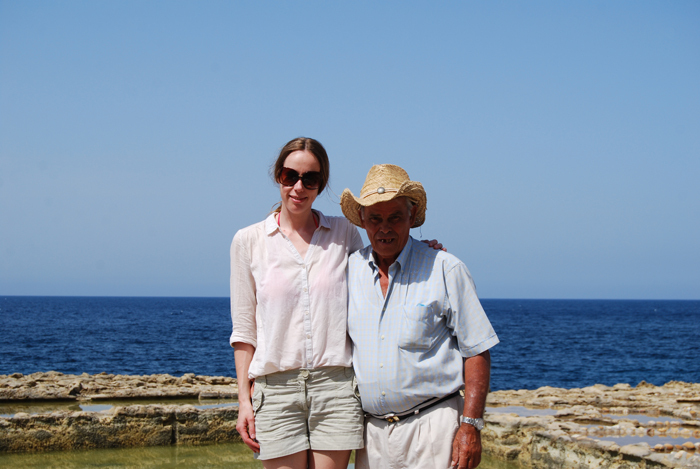 Rose Cini’s family has been harvesting sea salt for five generations. She herself has worked in the pans which are cut into the porous rock, all her life until the family almost stopped using them in the early sixties. Together with her husband Emmanuel, their daughter Josephine and David, their son-in-law, they have revived this tradition. 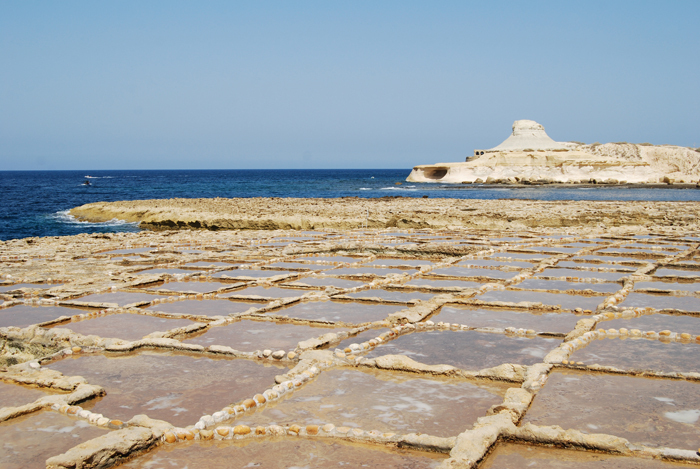 Salt pans have been in this location since Roman times. 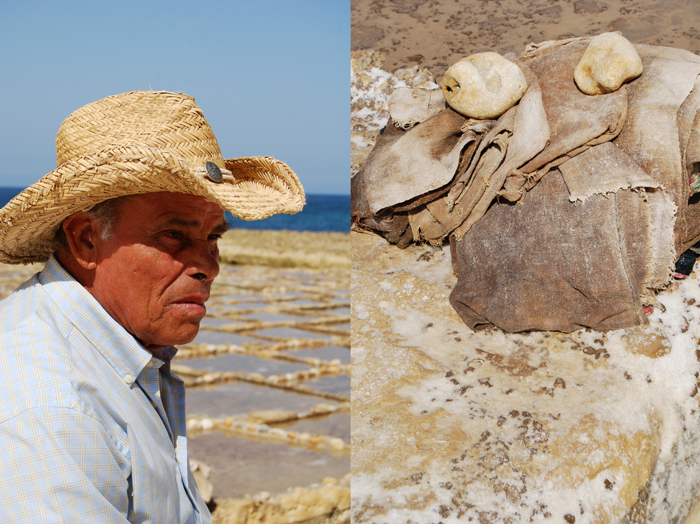 The position, the climate, the rock and the good quality of the sea water are perfect for salt harvesting. When Emmanuel married into the family most of the pans hadn’t been used for a few years and they weren’t in the best state. He decided to repair and clean them and to continue the family tradition in 1969. He built up a little family business which is now run by the four family members Emmanuel, Rose, Josephine and David. The four of them keep the pans filled with sea water between May and September. 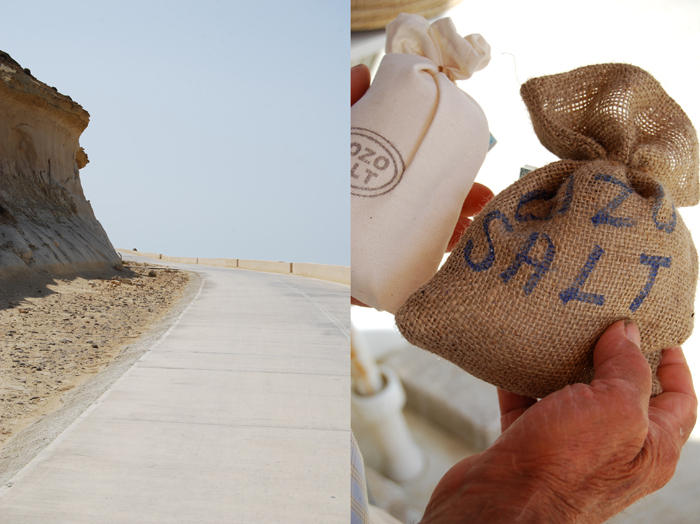 In June and July, the peak of the harvest season, they carry up to 3 tonnes of salt off the 300 pans each week! Sea water contains about 3.7% of salt, the water in the pans about 5%, as soon as the water is pumped up it will take around 7 days for it to evaporate. 24 liters of sea water are necessary to harvest 1 kg / 2 pounds of salt. 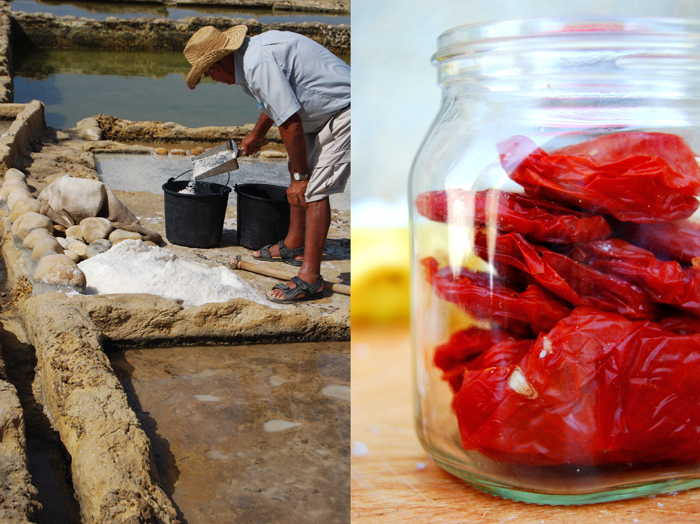 Emmanuel Cini has always wanted to keep the traditional way of harvesting the salt, work which is mainly done by hand; it demands lots of passion but also physical strength. 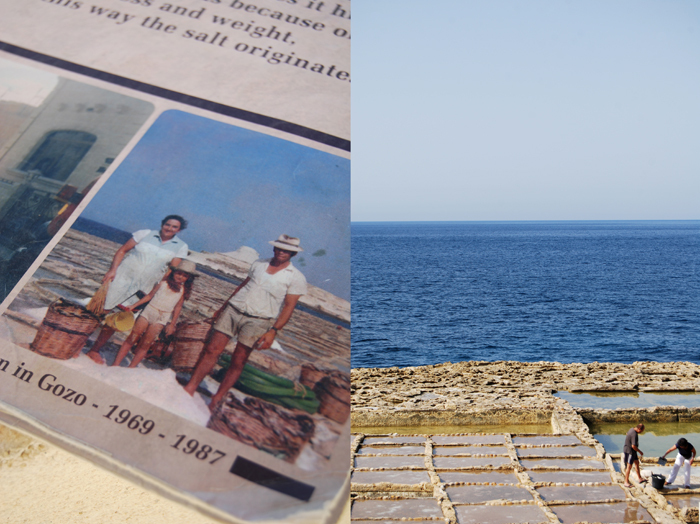 In 1974 he made a decision which was considered very modern at that time in Gozo, he was the first to pack the salt in plastic bags with his name printed on and sold it in shops all over the islands, he became the Salt Baron from Gozo! When I asked him if he sees his work as the perfect job he said “Yes, of course!”. Although it’s physically very straining, he never complains, as his daughter says. The whole family works at the pans, fills them, empties them and carries the salt up into a little cave which is cut into the stone to store the salt, the salt shop. That’s where you can buy it, or from the little table under an umbrella which they put out on the street from 10:30 to 17:00, every day, that’s where you can find the Cinis between April and December. 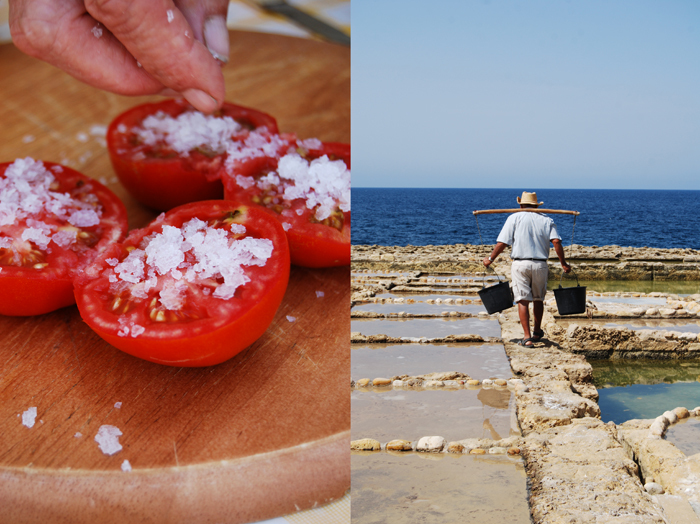 Gozo sea salt contains more than 80 trace minerals, I love the crystal’s flaky texture and the fine taste for my cooking! 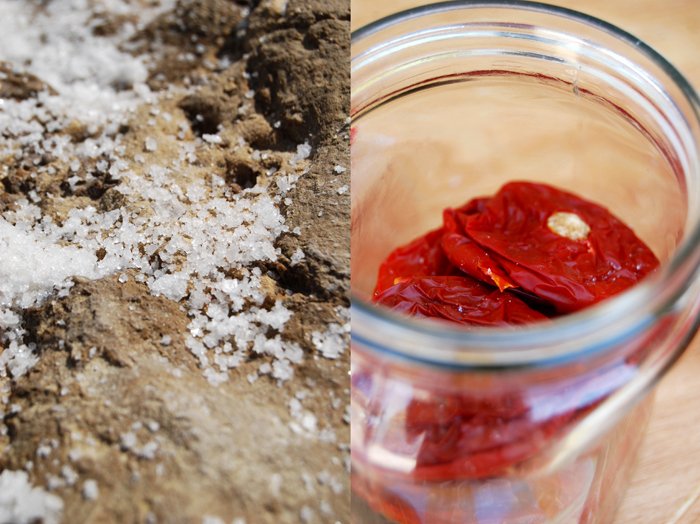 I have been buying my salt from the Cinis for many years and when I asked them if they would like to share a recipe on eat in my kitchen, Rose said that she would show me how to make sun-dried tomatoes in her mobile outdoor kitchen outside the salt shop. 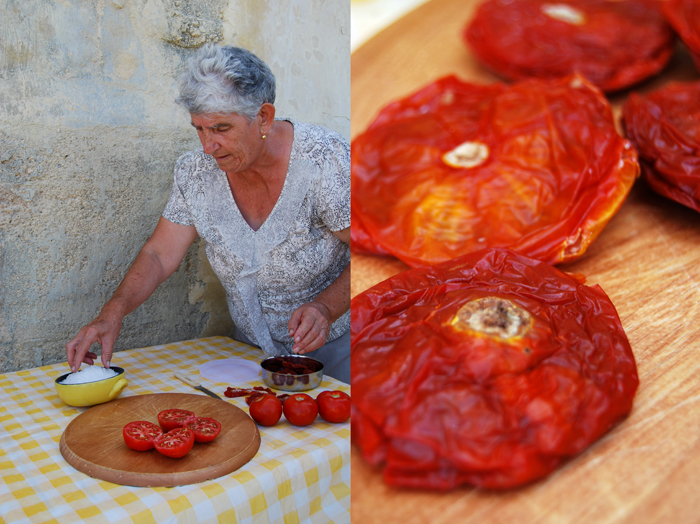 It takes between 4-6 days to sun-dry the tomatoes and the final result tastes divine! You need a hot climate and constant sun for this period of time to dry the fruits! Rinse and dry the tomatoes and cut them in half (crosswise). Spread them on a metal grid (cut side up) and sprinkle each tomato generously with sea salt. Leave the tomatoes out in the sun for 4-6 days, covered with a mosquito net by day and with a plastic sheet by night (to protect them from humidity). When the tomatoes are dried, rinse them and dry them in the sun for an hour. Store them in sterilized jars when they are completely dry with a handful of coarse sea salt. You can also preserve them covered in olive oil. How do I purchase Emmaule Cini’s salt on-line? 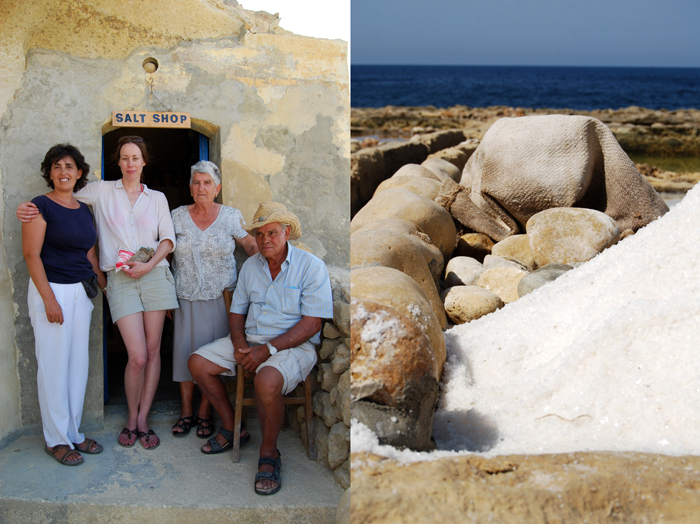 Dose anyone sell his salt on line (like a gormet shop in Gozo)? Hell of trip to buy some salt even if great. 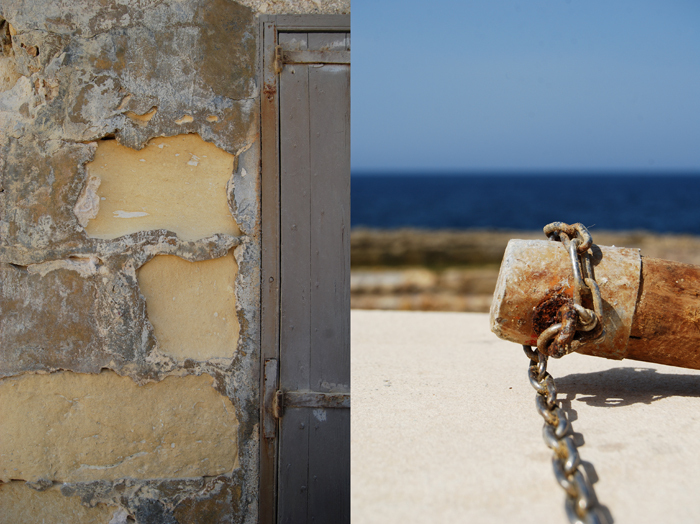 Meike, I have so enjoyed your holiday in Malta…makes me want to go there one day. The photos are just wonderful.